It gave me a way of grouping together the key themes I thought would appear in my thesis. When I sat down to read or write or analyse data, I would try to focus on one particular theme or section at a time. 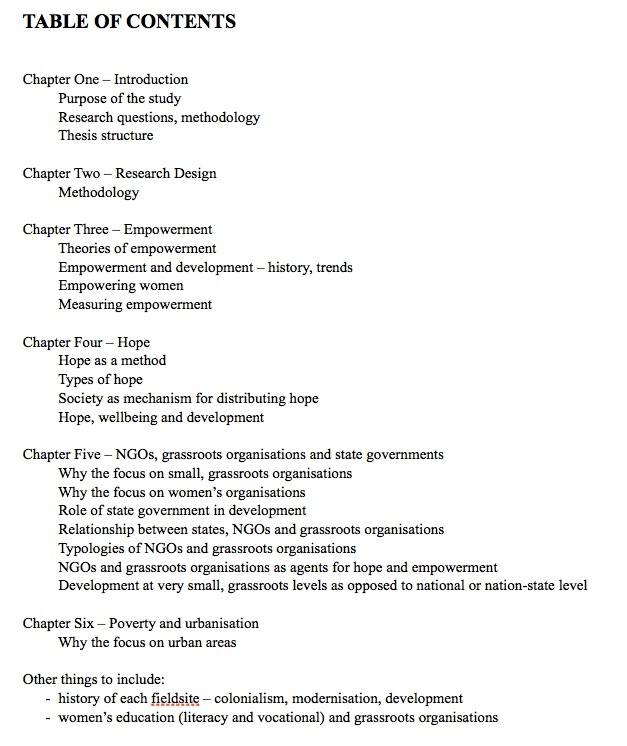 For example, after preparing this table of contents I spent about a month reading and thinking and writing about hope as an analytical concept. Of course I would get bored with one topic and go off on tangents into other areas, but I always felt like I had this tangential reading under control because I could see how it might eventually fit into my table of contents. Not long after I sent this version to my supervisors, they asked me to write a short description under each chapter heading explaining what it would contain. I thought this was a great idea and pretty soon my table of contents ballooned from a 1-page document to 7-8 pages in length. I spent a day putting together the first full table of contents into this style. I wrote at least one page under each chapter heading, outlining the aim of each chapter and how it contributed to my overall thesis aims as well as sketching what would be in it. As the months went by these descriptions became more and more concise (and I limited my table of contents work to one morning per month), and ended up being just a paragraph in length. I used the table of contents as a way of organising how I wrote. Breaking down chapters into subsections make the writing task feel more manageable, and each day I would set myself writing goals that would directly contribute to the thesis. For example, I would aim to write 500 words on fieldwork in multiple sites. Once I had done that, I was able to tick something off my to-do list and feel a small sense of accomplishment. As my thesis submission date drew near, I stopped working on a separate table of contents and compiled everything into one long Word document. The abstract I had been refining each month became the final version in my thesis. 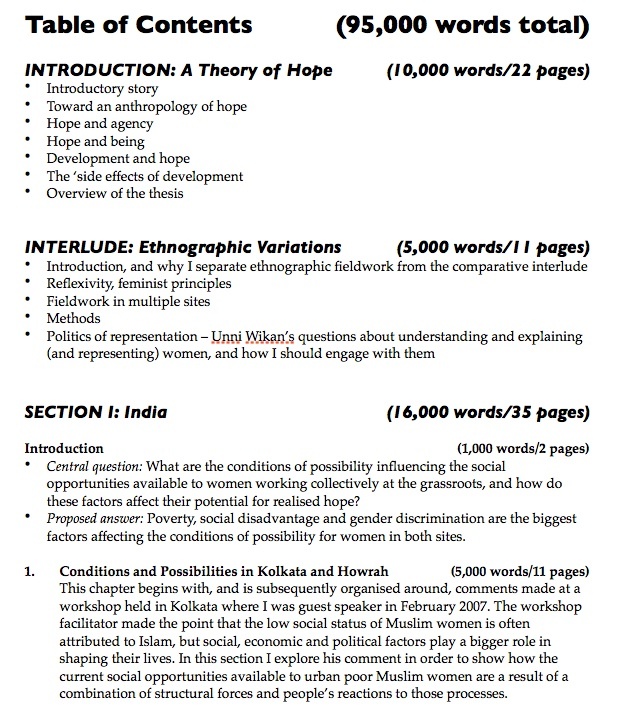 The work I had been doing on Overall Thesis Aims and Brief Descriptions of Parts I-IV became part of my Introduction. 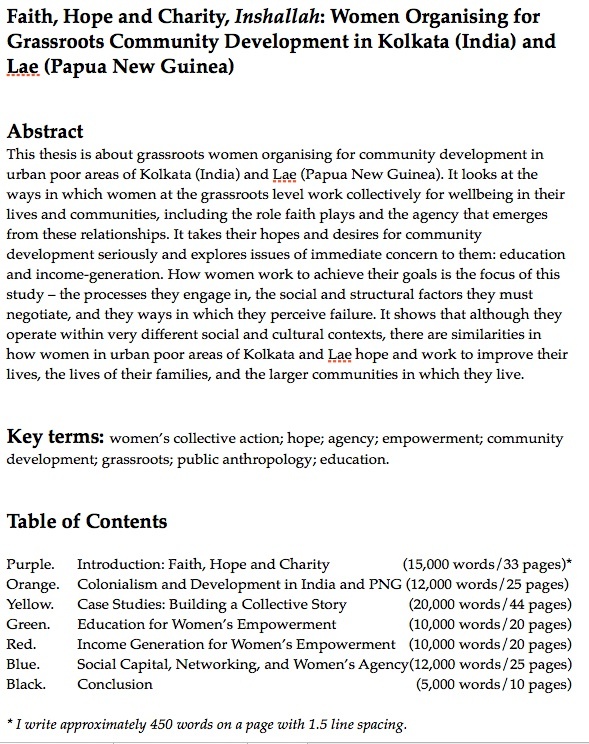 In fact, I used most of the text from my tables of contents in my thesis, often at the start or end of my chapters. Working with a table of contents was a useful way for me to conceptualise such a large piece of work as a unified whole. I’m a bit of a control freak so another benefit was that it let me maintain the illusion of control over what can be a very messy process. It also allowed my supervisors see how the pieces of work I would send them (in no particular order) fit into the overall thesis. I’m keen to find out about the kinds of strategies others used to pull together a MA or PhD thesis. Did you work with a table of contents? How did you map it out? I would love to hear from you! Posted on October 1, 2014 June 18, 2016 by lorenagibsonPosted in PhD, WritingTagged Academic writing, ethnographic writing.